Specificity/Sensitivity: Recognizes a protein of 36kDa, identified as cyclin D1. Cyclin D1, one of the key cell cycle regulators, is a putative proto-oncogene overexpressed in a wide variety of human neoplasms. 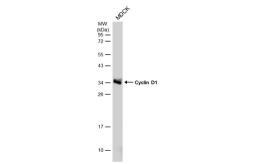 This antibody neutralizes the activity of cyclin D1 in vivo. About 60% of mantle cell lymphomas (MCL) contain a t(11; 14)(q13; q32) translocation resulting in over-expression of cyclin D1. 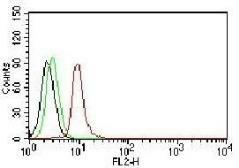 This antibody is useful in identifying mantle cell lymphomas (cyclin D1 positive) from CLL/SLL and follicular lymphomas (cyclin D1 negative). 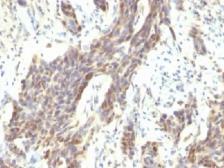 About 40% of breast carcinomas are positive for Cyclin D1. Occasionally, hairy cell leukemia and plasma cell myeloma weakly express Cyclin D1. Specificity/Sensitivity: Recognizes a protein of 36kDa, identified as cyclin D1. Cyclin D1, one of the key cell cycle regulators, is a putative proto-oncogene overexpressed in a wide variety of human neoplasms. 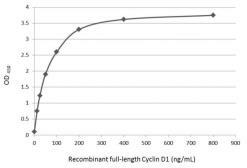 This antibody neutralizes the activity of cyclin D1 in vivo. About 60% of mantle cell lymphomas (MCL) contain a t(11; 14)(q13; q32) translocation resulting in over-expression of cyclin D1. This antibody is useful in identifying mantle cell lymphomas (cyclin D1 positive) from CLL/SLL and follicular lymphomas (cyclin D1 negative). Occasionally, hairy cell leukemia and plasma cell myeloma weakly express Cyclin D1.